The Tennessean quoted Bernard Health’s CEO [Alex Tolbert] in an article covering millennials’ perceptions of health insurance. The Nashville Business Journal andTennessean covered Bernard Health’s health care reform breakfast that showcased a panel of health care providers. In the Tennessean, Alex Tolbert [Bernard Health] wrote an article on this year’s fourth quarter and why it is the busiest in history for health insurers and brokerages. The Tennessean announced Primrose School’s purchase of a 17,000-square-foot building from the Sheats family who was represented by Eakin Partners [Barry Smith]. 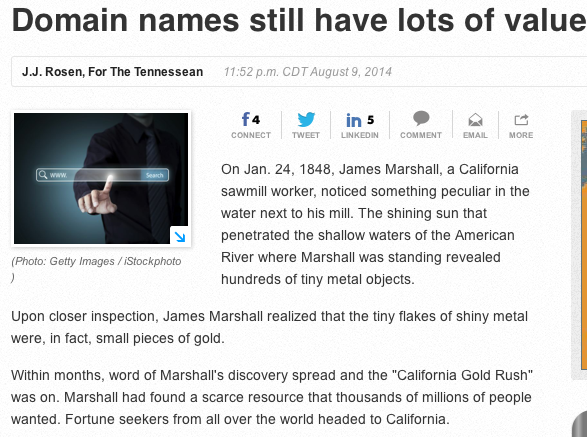 J.J. Rosen [Atiba, LLC] wrote an article in the Tennessean on today’s currency, domain names. The U.S. Lawn [Gene Robertson] annual conference in Nashville was featured in Lawn and Landscape. Clarksville Online announced that Edley’s Bar-B-Que [William Newman] will participate in Nashville Zoo’s annual Sunset safari. Intacct, a leader in cloud financial management and accounting software, recognized LBMC Technologies [Jeff McCorpin] as a company that delivers comprehensive, high quality services. According to Insurance News, LBMC is one of the initial members of Intacct’s new Premier Partner Program. Julie May [bytes of knowledge] wrote an article in the Tennessean on valuable apps that are allowing doctors, physical trainers and individuals to avoid health related issues and cut down on expensive medical costs. Corey Lile [OccuSure] wrote an opinion article on Transport Topics regarding Worker’s Comp Strategies for Trucking. The Tennessean featured an article written by John Huber [Moo Creative] on director Roman White’s latest video for Colbie Caillat. The Tennessean’s Nashville People in Business reported on Medalogix’s [Dan Hogan] recent growth. The article also announced that Max Goldberg [Strategic Hospitality] was appointed to the Nashville Convention and Visitors Corp.’s board of directors. The Greater Nashville Association of Realtors recognized Jessica Demas and Ronnie Lee Booth [Village Real Estate Services] as graduates of Leadership GNAR. Ashlyn Hines [Bristol Development Group] was quoted in the Tennessean article covering Bristol’s “pocket neighborhood” development in Franklin. 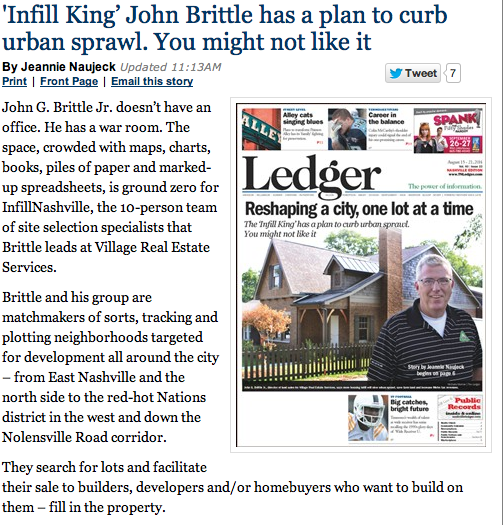 The Nashville Ledger outlined an interview with John Brittle, covering Village Real Estate Service’s well-known presence in Nashville and Brittle’s projections for where Nashville real estate is headed. Capstan Fund acquired three hardware stores north of Atlanta. Steve Curnutte has a quote in the Nashville Post article. The Nashville Post had an article on the rapid sales of Melrose condos, an effort spearheaded by Village Real Estate Services [Mark Deutschmann]. The Tennessean and Nashville Scene mentioned Bongo After Hours Theatre, an extension of Bongo Java [Bob Bernstein]. The Nashville Ledger and Nashville Post reported that The Nashville Area Chamber of Commerce and YP Nashville named John Crosslin [Crosslin and Associates, PC] the Emerging Leader in Financial services, noting that he had contributed to the 325 percent that the firm has grown. The chamber also recognized Jessika Leigh Poirier [Vaco Resources, LLC] as the Emerging Leader in Human Resources. Poirier was promoted to partner this year and is the No. 2 producer nationwide in the staff division. The Nashville Scene reported on Patrick Burke’s [Seed Hospitality] journey to Japan, recognizing the emphasis placed on authentic cuisine in his restaurants, specifically Two Ten Jack. The Nashville Business Journal quoted Stephen Zralek [Bone McAllester Norton] in an article on the Republican primary for the state’s 4th Congressional District seat.